These days, it's easy to cut the cord. Thanks to a new crop of streaming TV apps, you can get the same service offered by a traditional cable subscription at a fraction of the price. After some extensive testing, we believe we've found the absolute best apps for cord cutting. You can use these apps on your smart TV, laptop, desktop, and most set-top boxes, but we focused on the experience they offer on mobile. Nonetheless, we ranked the apps based on a combination of all their features, and we're aware that the channel lineup is likely your top concern, so we included a glanceable chart to help you compare their offerings. After the two charts below, you can scroll down to read our reviews for each individual service. Price: The price for the lowest and highest tiers offered by each service, not including add-on packages. For apps with only one option, such as YouTube TV and Hulu with Live TV, we placed the price in the base tier. Important Channels: Using data from Statista, we composed a list of the most viewed channels on cable networks. With this information, we counted the number of channels available within each app, then put them into four categories: Local channels, sports channels, news channels, and entertainment channels. The numbers listed in these sections of the chart tell you how many of the important channels each service offers in each category. Full chart below. Movie Channels Available: There are four major premium movie channels: HBO, Showtime, Cinemax, and STARZ. Typically, access requires an additional monthly charge, but some apps' plans will include one or more channels. DVR Storage: The ability to record live television to watch later. All five services offer a DVR, but the amount of storage varies. We listed the highest available storage option for the cloud DVR service, though note that some of these services may charge an additional monthly fee for the max storage tier. DVR Storage Expiration: How long DVR recordings will remain in storage before they expire and are automatically removed. 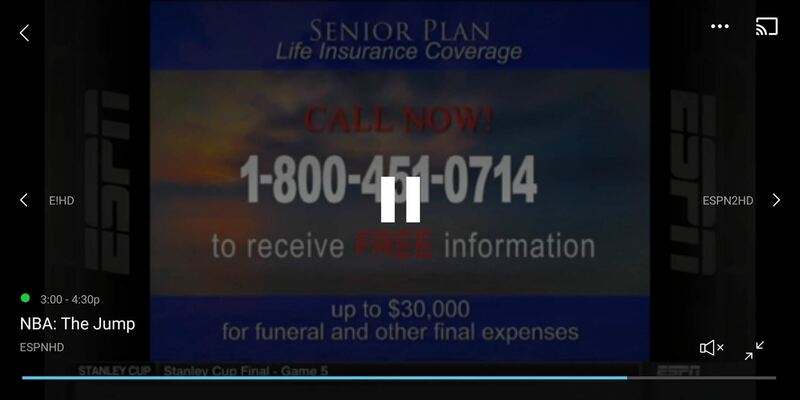 Fast-Forward Commercials: The ability to fast-forward through commercials while watching saved recordings. Number of Simultaneous Streams: The maximum number of unique streams which can occur at the same time. Using the same account, how many members of your household can watch a different channel. Max Resolution: The resolution of live television. Most channels output at 720p, with few channels supporting 1080p. Additionally, most sports channels support 60 frames per second (fps), which is ideal as the video is smoother thanks to doubling the standard number of frames. Audio Format: The highest available audio quality for live television. Only DirecTV Now offers 5.1 surround sound on some channels. Rewind Live TV: The ability to control the playback of live television. Pause and rewind should be available at any time, while fast-forward should only be available while behind the actual live feed. Video on Demand: Access to video on demand content (VOD). VOD operates similarly to streaming services like Netflix and are managed by the networks and include un-skippable commercials. Apple TV: Has official support for Apple TV. 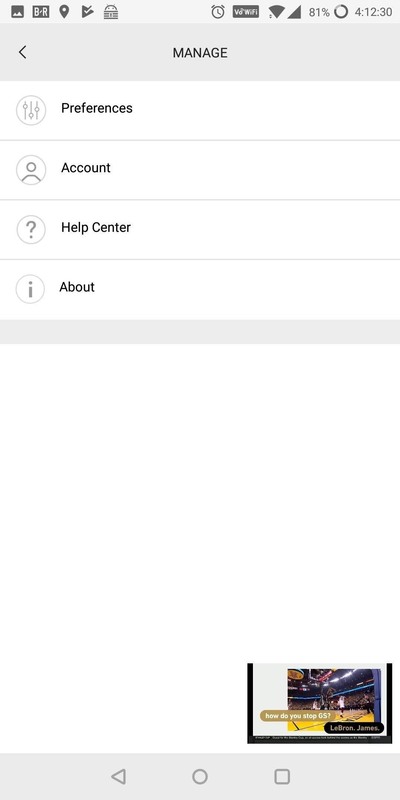 Chromecast: Has official support for Chromecast and Google Cast devices. Android TV: Officially supports Android TV devices. Roku: Officially supports Roku products such as the Roku Streaming Stick. 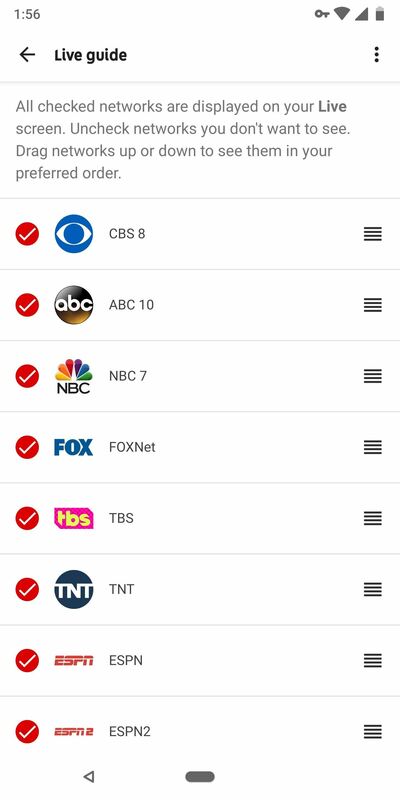 TV Everywhere: Many channels have their own mobile apps that require your cable provider login credentials to access. While the majority of networks have an app, not all networks let you use a streaming cable app's credentials. Therefore, the higher the number, the better chance your favorite channel is supported. Check out this link to see specific apps. One of the biggest factors in finding the right streaming cable service is the channel lineup, so we made a quick-reference chart of the important channels available on each service. Items marked in yellow indicate that you have to pay extra (more than a base tier package) to get access to that channel. It should be noted that Sling TV has two base tiers, effectively dividing their channel lineup in half. Our overall top pick is YouTube TV. The service, created by Google, offers live television at $40 a month. There are no multiple offerings, just one plan at one price. While its entertainment channel lineup is somewhat lacking, YouTube TV more than makes up for it in all other areas — particularly when it comes to sports. Let's start with the channels. While YouTube TV has the lowest overall number of important channels, it has the highest number of important local, sports, and news channels. Where it's lacking is with the entertainment channels, so if the likes of A&E, Comedy Central, and History are important to you, you might want to look elsewhere. YouTube TV also has the weakest lineup of premium movie channels. As of this writing, you can only add Showtime and Starz to your service. So you'll be missing out on shows like Game of Thrones on HBO, but you can always get HBO's standalone streaming service separately. Google tries to make up for this by including YouTube Red (a $9.99/month value), but original content here is still burgeoning. 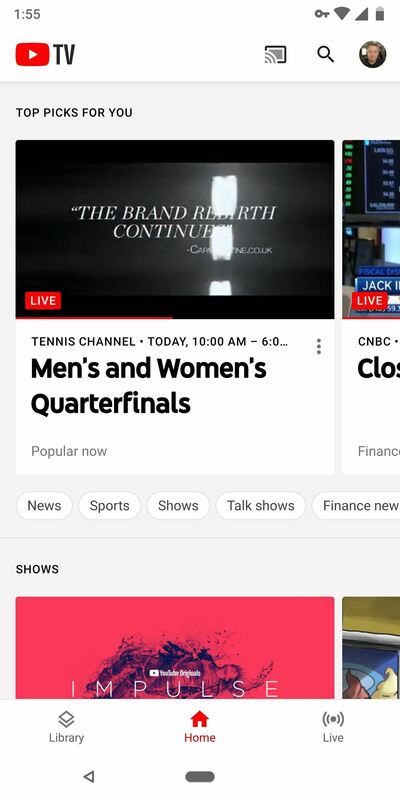 Where YouTube TV really shines, though, is in its sports content. All important sports channels are included in the base price of $40/month, and all five local network channels are available in every major city, so you can still watch your team on the local broadcast. You can even star your favorite teams and have all of their games automatically recorded. Another great sports feature that doesn't show up in our chart since there's nothing comparable in other services is "Key Plays." If you've starred a team or recorded a game, you can skip directly to important plays within this game to catch up on the action. Another key area where Google's streaming service excels is the cloud DVR. You get unlimited recordings, so you can simply star every show you could ever see yourself interested in and watch them for up to 9 months. Additionally, it's one of only two services to offer 1080p streaming at 60 frames per second, and it supports all major TV operating systems. YouTube TV is one of the only places where you can gain access to The Young Turks, a 24/7 YouTube-based news channel which YouTube TV has given their own live news channel. YouTube TV is also one of the only apps to support Android Oreo's picture-in-picture mode as well. Additionally, the guide is organizable, allowing to move channels around to your preference. Until March 12, 2018, YouTube TV was $35. However, after adding some Turner properties such as CNN and Cartoon Network, the price increased to its current $40. I mention this as it could potentially occur again as YouTube TV tries to close the gap in entertainment channels. However, customers who signed up for the $35 plan prior to March 12 were grandfathered in and will continue to only pay $35 indefinitely, so we expect this to happen again with any future price increases. YouTube TV also sports the slickest app of all the services on our list, and the service itself is snappy with consistent performance (after all, it's running on Google's servers). While this isn't quantifiable with an objective piece of data for our chart, it's a key aspect that really helps put YouTube TV on top. PlayStation Vue is a very solid option. It does a few things surprisingly much better than the competition, including simultaneous streams and TV Everywhere. However, it is Vue's few shortcomings that ultimately prevented it from taking our top spot. Let start with the good. Vue has the second highest number of simultaneous streams at five. 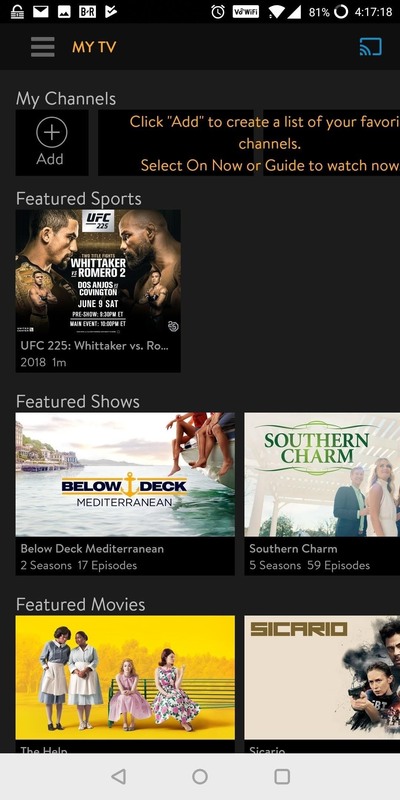 When you initially subscribe, Vue provides three simultaneous streams which can be used both at home and away from the house. 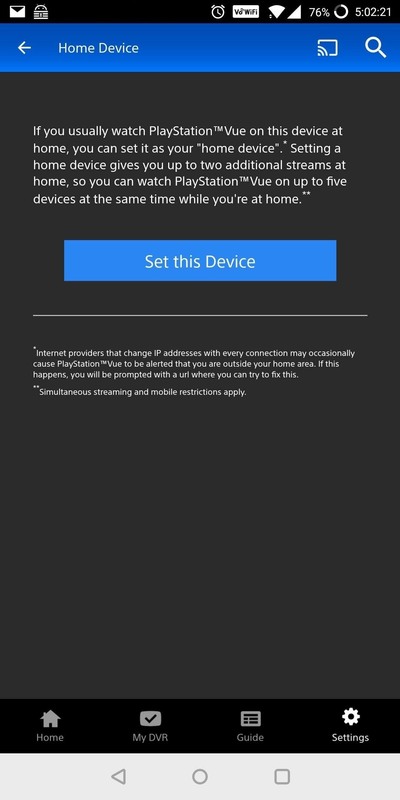 Once you set up a home device, you will receive an additional two more in-home streams. There are, however, some limitations. For mobile users, only three simultaneous streams can happen at the same time. Additionally, NFL games broadcast on channels outside of ABC or ESPN (so essentially, everything but Monday Night Football) are unavailable on your smartphone. But Vue makes up for this by offering the largest number of TV Everywhere supported apps. In other words, you can sign into more network-specific apps with your Vue account than with any other service. 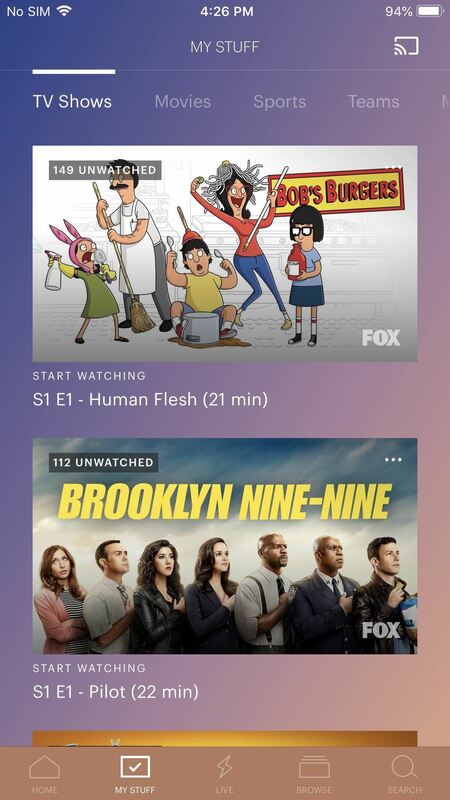 Oftentimes, these third-party apps have much more content on-demand, including earlier seasons of current shows. This also provides a way to bypass simultaneous viewing restrictions, as most TV Everywhere apps don't count against your cap. PlayStation Vue is the only app on our list which lets you watch local news and sports away from home. Typically, streaming apps will show you local news and sports based on your location. However, with Vue, if you are away on vacation, you can still watch your local team play on the same channel you would if you were home. 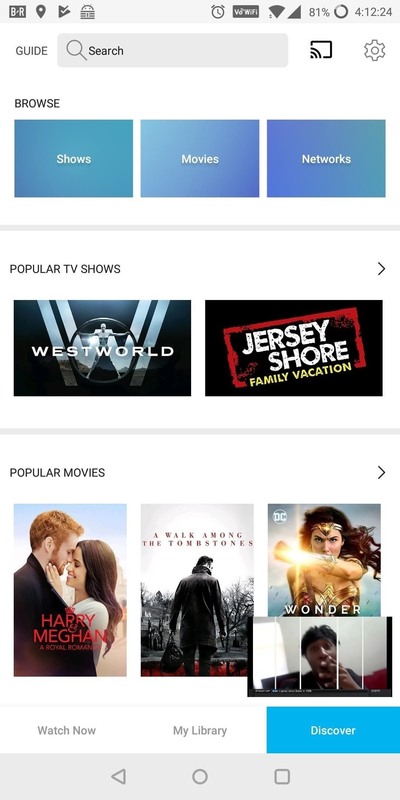 Vue is one of only two apps with unlimited DVR storage, though technically, there is a limit: You can only record up to 500 different shows (overall shows, not episodes). Unfortunately, the recordings will expire after 28 days. Once this occurs, Vue will switch your recorded shows to on-demand versions, removing the ability to fast-forward past commercials. Vue also supports 60fps, the ideal frame rate for sports watchers. However, the resolution is limited to 720p. Furthermore, unlike every other app, regional sports isn't included in the basic package, requiring you to upgrade to the $45 a month plan. Additionally, Vue is the only app that doesn't have access to Fox Sports Networks, significantly limiting access to local sports. PlayStation Vue is very much deserving of it second place ranking. While there are some minor limitations, its balance of channel lineup and price make it a great service overall. And with its five simultaneous streams, high TV Everywhere support, and unlimited DVR storage, Vue is definitely an attractive option for larger families. 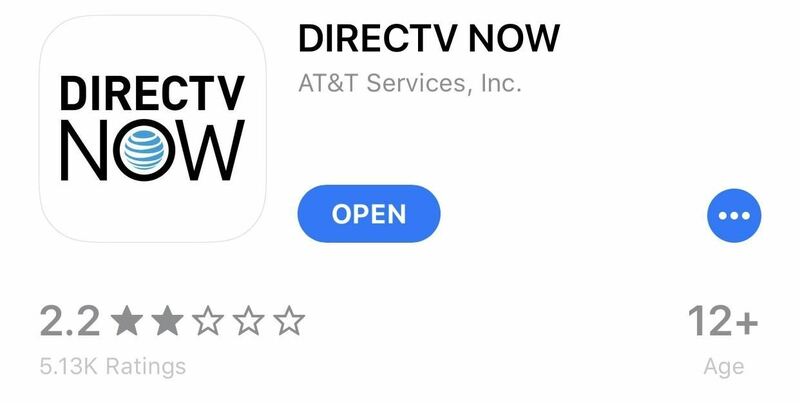 While DirecTV Now is the one of newest services on our list, it appears that AT&T (the new owners of DirecTV) studied its competition thoroughly before entering this market space. The result is a well-balanced app that offers an unprecedented number of channels on its highest tier and tied for the lowest base tier pricing. When it comes to entertainment channels, DirecTV Now is your best option. Not only does the service offer all 15 important entertainment channels, but they're all included in the the base tier. 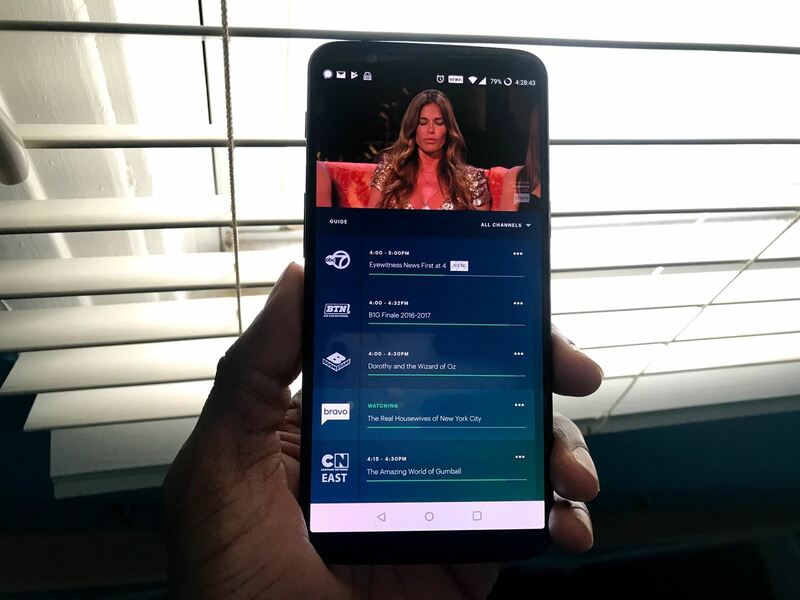 However, one area where DirecTV's offering lags behind is the aforementioned tiers — unlike YouTube TV and Hulu below, you can quickly bring your bill back up to traditional cable prices if you want access to certain channels. On one hand, options are a good thing, but on the other, it's the same nickel-and-dime approach that has pushed many users away from traditional cable and satellite subscriptions. For instance, while the important sports channel list on DirecTV Now is respectable at seven out of eight key channels available, to get access to all seven, you'll need to pay $65 a month. 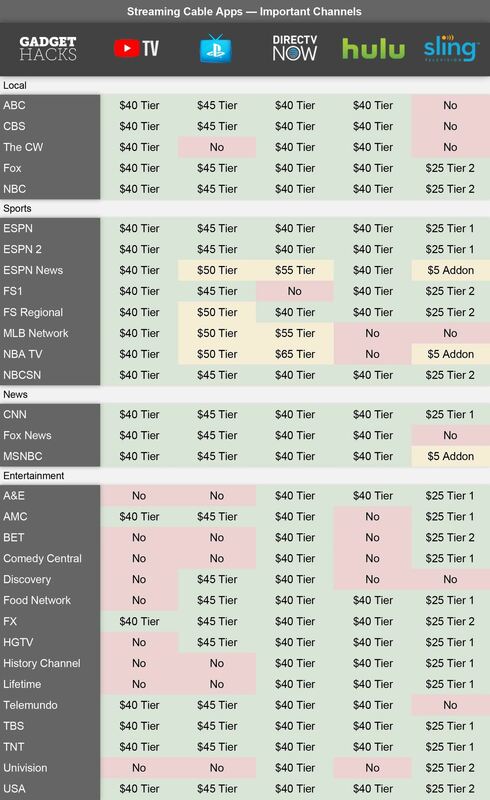 The base $40 plan only includes four important sports channels. In addition, only two simultaneous streams are available for free, with the third costing an extra $5 a month. On the plus side, DirecTV Now is the only app to offer Dolby Digital 5.1 surround audio for Apple TV devices. Furthermore, it also supports a maximum resolution of 1080p at 60fps. Both of these features require the channels to support the technology, but it is nice to know the app is future-proof. Do note, the latter feature is only available in the beta version. There's no Android TV app, which is unfortunate, though the other major TV platforms are supported. But the biggest downside is that you can't rewind or fast-forward live television on mobile devices. Instead, you're limited to pausing, and once you press play, it will return to the live feed, skipping anything you missed. Overall, DirecTV Now is an excellent value for cord cutters. It has a wide array of channels, including many of which you've come to expect from traditional cable providers, and its feature list is steadily improving. 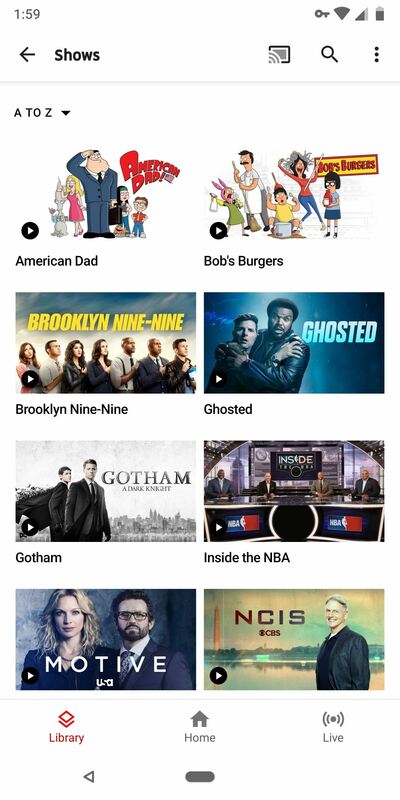 Similar to YouTube TV, Hulu with Live TV uses a one-plan-fits-all strategy. While there are some obvious limitations to this strategy, it does strongly push Hulu to a low price to remain competitive. The result is a service with a competitive price that offers a comparable product to the others app on our list. 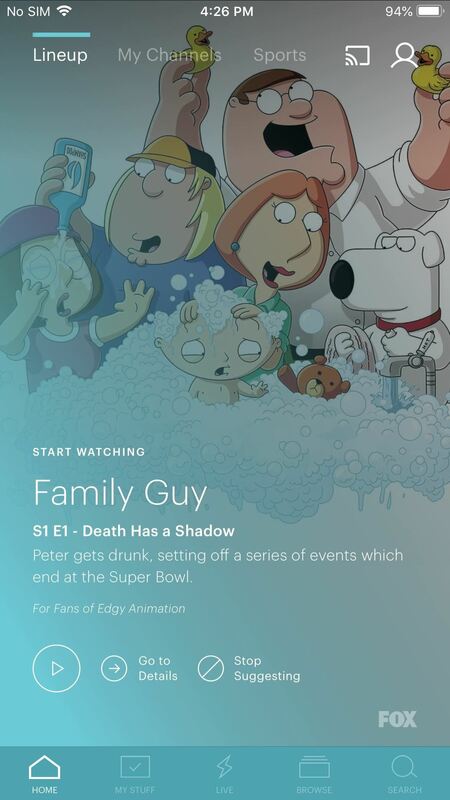 One of the strongest features of Hulu is its channel selection. Hulu has the third largest number of important channels. While it doesn't top any specific subcategory, it does have a great selection of local channels, sports channels, news networks, and entertainment channels. The base plan includes a DVR with up to 50 hours of storage which never expires. However, you can increase the storage capacity to 200 hours for $14.99. This same add-on, known as the Enhanced Cloud DVR, will also enable the ability to fast-forward commercials (the standard 50 hours doesn't allow this). Hulu with Live TV is the only service to offer unlimited simultaneous streams. It does require a $14.99 add-on, and the unlimited streams are limited to devices on your home network. However, you do also get three additional streams for TV watching outside the home. To save some money, you can add both add-ons for $20. However, the most significant advantage of Hulu with Live TV is access to Hulu's streaming library. As a Live TV member, you'll save the $11.99 price of Hulu with No Commercials. Not only does Hulu have a better catalog than most networks' on-demand libraries, but it has several exclusive series not found anywhere else. And if you want to use video-on-demand service, you also have access to that as well. The reason for Hulu's fourth-place ranking is the fact that it's the worst offering when comparing shared features. For example, Hulu offers three of the four premium channels while three other apps provide all four. While live television streaming from Hulu has been upgraded to support 60fps, it is still stuck at 720p, while some of the competition has upgraded to 1080p. However, don't look past Hulu with Live TV. Not only is it a great app, but it's arguably the best value. At $39.99, you get access to Hulu's extensive catalog of videos (including exclusive content) along with live television. While you will probably need to spend the additional $20 for the two add-ons to get the most of the service, this price is still much lower than most cable bills and is contract-free, so you can leave at any time. Sling TV is the best choice if price is your highest priority. While Sling TV isn't without its faults, it does offer the lowest pricing and the widest selection of plans, packages, and add-on channels. This makes it easy to pay the lowest price to get the exact channel lineup you want. Sling TV starts at only $25/month, unmatched by any other app on our list (the closest competitor pricing starts at $40/month). It has two base-tier plans to choose from, and they're both $25. In fact, the most expensive plan is the same price as the base plan for other apps on our list. However, things can get pretty complicated fast. Sling TV has two base-tier plans: Sling Orange and Sling Blue. Sling Orange has one set of channels, and Sling Blue has a different channel lineup and doesn't include the channels in Sling Orange. So if one of your must-have channels is on the Orange tier and another is on the Blue tier, you'll have to purchase both base tier plans for $40 a month. And that's before you start talking add-ons. The two-plan system introduces more problems — for example, the number of simultaneous streams. Technically, Sling Orange is only permitted one stream while Sling Blue is allowed three. The way it achieves four streams is by purchasing the Sling Orange + Blue plan and using both plans' maximum number of streams. What this translates to is if one person is watching a Sling Orange channel (such as ESPN), no one else can watch that channel at the same time. Instead, they are limited to three streams of Sling Blue channels. 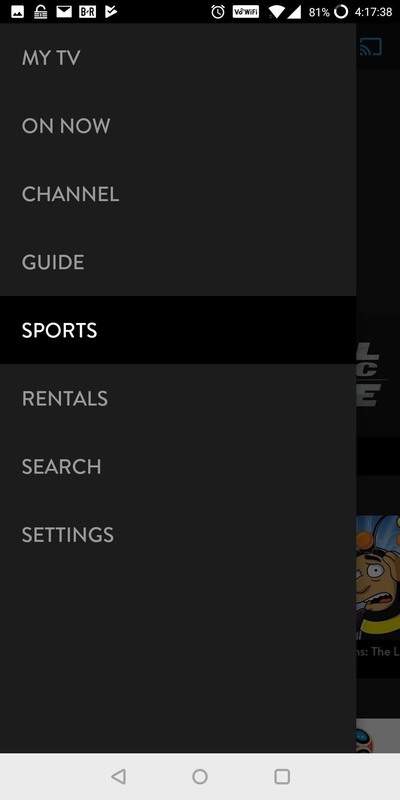 Sling TV is also the only app that charges for access to the cloud DVR service. You must spend an additional $5 on top of the monthly fee to access the DVR, which has one huge limitation — you can't record any Disney-owned channels, including ABC, Disney Channel, and ESPN. However, Sling TV isn't all bad. There is a number of advantages it has over the competition. 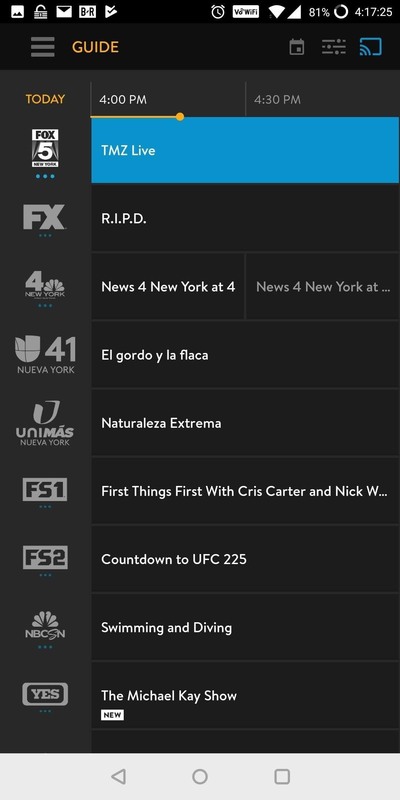 For example, Sling TV is one of two apps on our list which doesn't delete recordings stored on the cloud DVR. Sling TV is also one of only three apps which includes access to all four premium movie channels. If you are looking to save the most money on your TV bill, Sling TV is your best bet — as long as the channels you're after are on the right tier. It offers an unrivaled price while lacking little in terms of features. While it does make several compromises, these can be forgiven thanks to its flexibility. 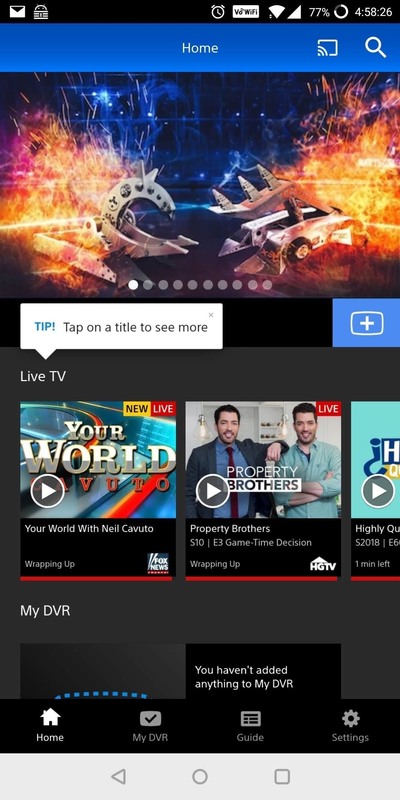 YouTube TV is our top pick because of its great selection of news, sports, and local channels at a reasonable price, its smooth and polished app experience, unlimited DVR, and its cross-platform availability. 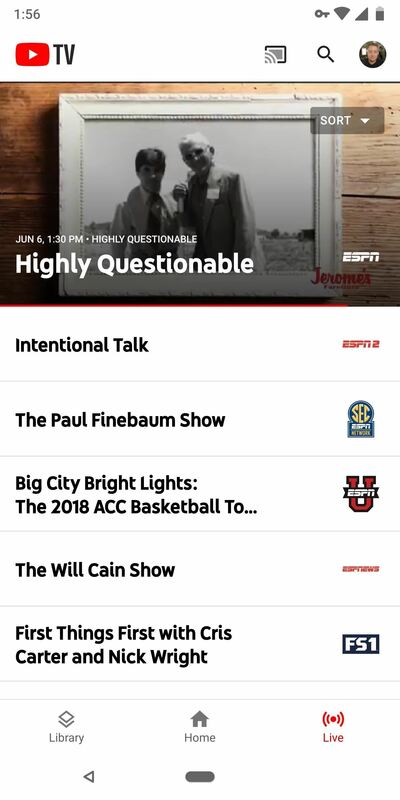 Overall, it's the service to pick if you're a sports fan, but it's not a great choice if you're looking for entertainment channels. PlayStation Vue comes in a close second, offering a similar balance of channel selection and price. It lacks the polish of YouTube TV's app experience, but it closes the gap by offering more entertainment channels, and it sets itself apart from the rest of the pack by giving you the most simultaneous streams — perfect for big families. DirecTV Now ranks number three thanks to its incredible selection of channels. The drawback is you pay for what you get, as the service tiers can quickly run up your bill into traditional cable TV territory. Hulu with Live TV slides in after that with a good list of channels and included Hulu streaming, but lags behind in terms of app features. Sling TV took the final spot with its flexibility, which can be a blessing or a curse, depending on which channels you're interested in. Jon Knight contributed to this story.